One of her most memorable looks was the £245 blue-and-white Lasa Poppy dress, which she wore to a tour of an Australian air base in 2014; plus the £400 floaty number she donned to meet Barack and Michelle Obama in 2016 — both of which were instant sell-outs. 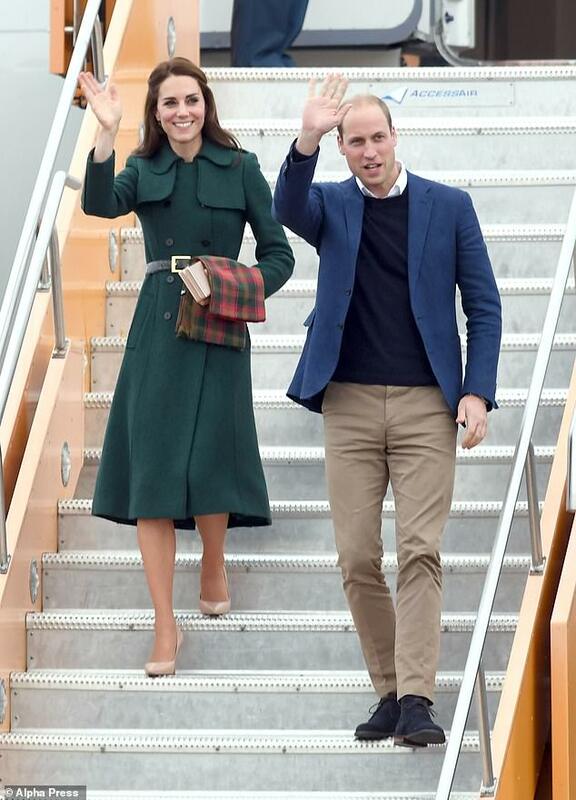 Kate (left) wore this Hobbs teal coat during a visit to Whitehorse in Yukon Territory, Canada, with Prince William (right)Her most-worn Hobbs pieces are coats — most memorably this £279 emerald green Persephone trench she wore on St Patrick's Day in 2014, and dresses, such as the £169 Animal shirt dress she chose for a charity event in London in 2015. She also turned to Hobbs for her final engagement before giving birth to Prince Louis, in March this year — the £79 polka-dot Rosie top — which promptly sold out worldwide. Her first high-profile outing in Orla Kiely came in February 2012, when she wore the brown wool 'Birdie' dresscoat to visit a school in Oxford – and ended up with a splodge of red paint on the sleeve. Ever-thrifty, she wore the coat again in November 2013, on her return to the spotlight after Prince George's birth. She also owns a grey pleated dress by the designer, which she wore for a charity engagement in October 2015, and this powder pink appliqué frock which she donned at Paddington station in November 2017. Most recently, she chose the Leith Margaret smock dress, a £490 mid-length black floral design, for the opening of an exhibition at the National Portrait Gallery in March. Mum Carole and sister Pippa are fans, too, with Carole sporting a blue polka-dot dress to hospital to meet Prince George in July 2013, and Pippa wearing a £120 white Kiely blouse on her honeymoon. The Brazilian - born designer, who started making dresses when she came to Britain in 2000 and built a cult celebrity following, said her company had been in 'serious financial trouble' — but Kate turned its fortunes around. The £400 garment sold out in five minutes and was reordered 'countless' times, with one New York department store buying 1,100. 'We soon knew Kate was wearing Issa because the phones began ringing and didn't stop,' Daniella explains. 'It was bonkers.' Kate had worn the label previously, buying dresses directly from Daniella's studio, but the designer had no idea the dress would feature on such a momentous occasion. At its peak, the brand's value boomed to £47million. But the Duchess's endorsement also triggered its demise. 'I didn't have the money to finance production on that scale. The bank refused to give me credit and the factory was screaming for me to pay its bills,' says Daniella. Later that year, she sold 51 per cent of the business to close friend Camilla Fayed, daughter of Egyptian magnate Mohamed Al-Fayed. But relationships soured and in 2013 Daniella quit as creative director. Issa closed two years later. Having cut all ties, Daniella did produce special £200 versions of her iconic dress for a United Nations moneyraiser in 2016, then launched a new clothing line of her own, Dhela, in 2017. Kate (left) wore this Alice Temperley dress to The Portrait Gala fundraising dinner in London in March 2017She chose Temperley London, founded by 43-year-old Alice — dubbed the 'English Ralph Lauren' — for a post-engagement outing to Wimbledon in June 2011, and again in 2014, when she wore a daring black cut-out number to a London charity event. Both times the garments, which can cost up to £5,000, sold out overnight, with fans flocking to the website. In a 2013 interview, Alice, who said she received no prior warning when Kate was about to step out in one of her creations, described The Duchess as 'the perfect modern-day woman'.